(CNN) -- Christina Cimino was logging onto Twitter on Thursday morning when something happened that she found deeply unsettling. 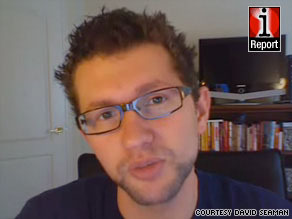 iReporter David Seaman says Twitter needs a competitor so users don't panic when it goes down. "I got some weird error message, and I'm like, 'What's going on!?" the 24-year-old said. That error message was the scourge of online social networkers worldwide on Thursday as cyber-attacks shut down Twitter and caused sustained glitches in other social-media sites like Facebook and the blogging site LiveJournal. Twitter co-founder Biz Stone wrote the sites were the victims of what "appears to be a single, massively coordinated attack." And a pro-Georgian blogger, whose accounts on Facebook and Twitter reportedly were the targets of the denial-of-service attack, told CNN the online strike was timed to coincide with the one-year anniversary of the Russia-Georgia conflict. Part of the panic relates to the sheer popularity of the sites. Twitter saw a more than 1,300 percent jump in unique visitors between February 2008 and February 2009, according to Nielsen NetView. The site, which lets users post messages of 140 characters or less, had more than 44 million worldwide users in June, according to comScore. More than 120 million users log onto Facebook at least one time each day, the site says. To be sure, not all Facebook and Twitter users freaked out because of the attacks. Some people even reveled in the mayhem. Blog: Could the attacks be our fault? But for people like Cimino, who said she "felt naked" without access to Twitter, the attacks were a serious reality check -- a chance to evaluate just how dependent they'd become. "You know how you pat your pockets for your cell phone and your keys? Well it's that same kind of phantom [limb] with Twitter," she said. "It's like, 'I can't update! I can't update!' It's just one of those bugs that gets in you." She added: "I was pretty upset, actually. It feels like a lifeline for me ... Pretty much everyone knows almost every detail of my life by what I'm doing on Twitter." It's not worth analyzing whether these online connections are good or bad because the reality is that Twitter and Facebook are now an important part of our lives, said Marc Cooper, a journalism professor at the University of Southern California's Annenberg School for Communication. "For many people, and not just young people, the Web is not just media, it's actually a place where they conduct their lives or a portion of their lives," he said. "So the panic [Thursday] morning is only reflective of that. This is not just a hobby or an amusement or another accoutrement, it's actually deeply woven into their lives and is integral to their social interaction. So when it's cut off, it's a problem." Others saw Twitter's existence as the problem and relished the chance to make fun of a Web site that has become so omnipresent in news cycles. "Horrors!!! People will have to communicate face to face!" one user commented on CNN's SciTech blog. Another commenter said, "Turn off your computers and read a book or get outside and discover there is more to life than cyberspace. The Internet has become nothing more than the new cocaine." Now that Twitter is back online, the No. 1 conversation thread on the site is called "whentwitterwasdown," where users discuss what they did without their real-time Twitter updates. Some people are mocking the blackout. A user named PaulWilks, for instance, wrote, "I took up juggling." Others seem concerned. "I did absolutely nothing. It's like my heart was gone," wrote a user named HarajukuxBarbie. "I felt so empty inside," wrote another Twitter user called freinhar. Some business people on Thursday realized just how much they depend on Facebook and Twitter to do their work. Adam Ostrow, editor-in-chief at Mashable, a blog that covers social media, said the outage made it difficult for his organization to cover the news and to promote its stories. "For someone like myself who spends all day on Twitter, it's incredibly frustrating," he told CNN.com Live . Justin Stauffer, a 31-year-old who works in Web strategy at a marketing company near Philadelphia, Pennsylvania, said Thursday's attack made him realize just how dependent on Twitter he had become. "When something that's so central to how you do your business or how you gather information goes down, yeah, you get a little jittery -- like, when's it going to be back," he said. "I didn't break out in hives or anything like that," he said, jokingly. And Amy Gahran, who writes about social media on a blog called Contentious, said all technologies can break down, so people need to make contingency plans. "Hell, when you get down to it, you can lose your voice or break your writing hand or have a stroke and be unable to communicate. We are fundamentally social creatures, and when we lack our usual communication channels it's scary," she writes. "Don't panic. Have a backup plan, and be prepared." Cooper, the USC professor, said the fuss surrounding Thursday's attack is a sign that instant, online communication is here to stay. Fighting the trend would be like trying to stop the ocean's tides, he said, but it's unclear where the technology will take our society. "The bottom line is that we don't know. All of this is too new," he said. "It's like sitting around in the year 1500 and trying to figure out where the printing press was going to take us."